I am really proud to announce the first public release of the UMBEL Ontology and its subject structure after one year of hard work with Mike. 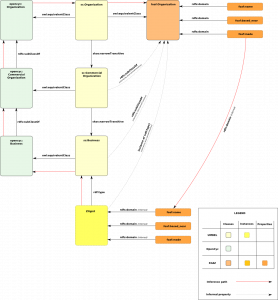 “UMBEL (Upper-level Mapping and Binding Exchange Layer) is a lightweight ontology for relating external ontologies and their classes to UMBEL subject concepts. UMBEL subject concepts are conceptually related together using the SKOS and the OWL-Full ontologies. They form a structural ‘backbone’ comprised of subject concepts and their semantic relationships. By linking external ontologies to this conceptual structure, we explode the domain of the linked classes by leveraging this conceptual structure. UMBEL defines “subject concepts” as a distinct subset of the more broadly understood concept such as used in the SKOS/OWL-Full controlled vocabulary, conceptual graphs, formal concept analysis or the very general concepts common to many upper ontologies. We define subject concepts as a special kind of concept: namely, ones that are concrete, subject-related and non-abstract. Mike Bergman wrote a really good introduction blog post about UMBEL that lists all the supporting material and services that exists to get starting with UMBEL. In this blog post I will write about one example that shows how to leverage UMBEL in two different ways: (1) how to use UMBEL to “explode the domain” of an existing ontology and (2) how to use UMBEL when an ontology doesn’t exist to describe a certain domain. I will also write other blog posts in the coming days to show more ways to leverage UMBEL in different settings and how to use it to solve other kind of real world problems. Some of this new material will begin to hint at Zitgist’s own plans for using UMBEL. How many times have people tried to use FOAF to describe organizational entities? In the end, everything ends up being assigned to foaf:Organization. A company, a NGO, or any other kind of organizations were all foaf:Organization(s) or foaf:Group(s). In most cases the result was unsatisfactory and everything ended up being the same “classification”. But I don’t want to describe a business as an “Organization”, or a NGO as another “Organization”. They are two quite different concepts, even if the upper concept that links them is an “Organization”. However, there are no ontologies (that I know of) that describe businesses and NGOs; and FOAF is not expressive enough to do that distinction. However, is it FOAF’s goal to be that expressive? Possibly; but not in its current state. So what we want here is to extend it: to explode its domain! And, it is what we will do with UMBEL. The goal is to link FOAF classes to UMBEL subject concepts so that we can extend FOAF’s classes with more general and more specific concepts such as Business and NGO. If you take a look at how the FOAF ontology has been linked to UMBEL, you will notice that a foaf:Organization is equivalent to an sc:Organization. Note: the linkage of external ontologies classes is consistent within UMBEL. It is UMBEL’s view of the World. As you can notice with this example, Zitgist is defined as a sc:Business. Well, you are probably wondering what is a sc:Business? Let’s take a look at the subject concept’s detailed report: sc:Business. The next question is: why can I use all these properties to describe a sc:Business? The quick answer is because foaf:Organization is linked (equivalent to) sc:Organization and that sc:Business is a sub class of sc:Organization. You can read the proof here; and check the figure below that shows the inference path that leads us to this result. The Named Entities section lists a couple of named entities that belong to this subject concept class. These are direct, or inferred, Yago named entities that belongs to this subject concept. The More General External Classes section lists the external super-classes linked to this subject concept. So we can quickly notice that a sc:Business is a foaf:Organization, a foaf:Group and a foaf:Agent. The in-domain-of and in-range-of sections list the properties, defined in some external ontologies, that can be used to describe that subject concept. So most of the properties that I used to describe the Zitgist business above should appear in this list (except if the ontology hasn’t yet been linked to UMBEL; but a dozen are already so as shown in Appendix A of the main technical document). The More General Subject Concepts and the More Specific Subject Concepts sections list the super-concepts and the sub-concepts of the current subject concept (sc:Business in that case). So, we can use UMBEL to describe an even more specific kind of business, for example: an Airline Company. Or we can use UMBEL to describe a more general kind of business: a Commercial Organization. Finally this Detailed Report Web Service helps people to put a given subject concept into context: how it is related to external ontologies classes; how we can use properties to describe individual of these concepts; how is it related to other subject concepts? It is the tool to answer these questions. In this blog post we saw how external ontologies classes can be linked to UMBEL to explode their domain: so to enhance their expressiveness. Additionally we saw how to use UMBEL web services to analyze a subject concept and to see its relations with other subject concepts, external classes and properties. However this is just the beginning of our exploration of UMBEL. Many things are waiting for us at the corner. I am starting to write a series of blog posts that will show you different uses and characteristics of UMBEL. All of them will be explained using real world use cases and challenges. We will see how named entities are related to UMBEL subject concepts. We will see how named entities data sources such as Yago and the John Peel Sessions have been linked to UMBEL. We will see how the UMBEL Vocabulary can help people to describe subject relationship between: a RDFS class that can be linked to a subject concept (using umbel:isAligned and owl:equivalentClass); a named entity to a subject concept (using umbel:isAbout and umbel:linksEntity); and a named entity to another named entity (using umbel:isLike and owl:sameAs). As you can notice, this is just the beginning. In meantime you can read the technical documentation to have a better understanding of UMBEL. And additionally you can read all the volumes that have been written to explain UMBEL’s evolution and the steps that lead to the creation of this of this first public release of the ontology. Finally, you can now start using UMBEL in your own applications. I would suggest you to revisit the UMBEL web services by reading my previous blog post: Exploding the Domain: UMBEL Web Services by Zitgist. Additionally I would suggest you to try to dereference subject concepts URIs such as: http://umbel.org/ns/sc/Project and http://umbel.org/ns/sc/Organization. All UMBEL Vocabulary’s classes and properties are dereferencable. All UMBEL named entities are also dereferencable along with all subject and abstract concepts.